For centuries, people have been enthralled by the mystic and legendary Camelot of the time of the wise King Arthur of England. While many have felt that simply believing in its existence is sufficient, others desire tangible proof of this magical city. The main reason for this is that in the modern life full of stress, commitments and deadlines, many find inner peace in dreaming about a calm magical city where even the impossible is within tangible grasp. 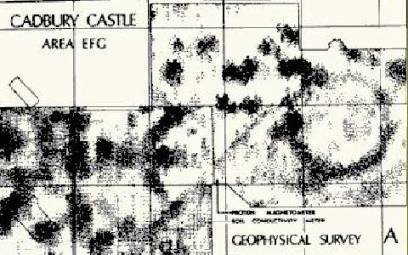 Thus, in the 1960s the Camelot Research Committee was created out of a team of like minded researchers in an attempt to discover the city’s true location by examining archaeological data from a variety of potential places. The contested possibilities are Cadbury Hill (the site excavated by the CRC), Winchester and Caerleon, but all have fairly convincing arguments to their claims. In an analysis of findings related to the location of Camelot, a critical approach has been taken in order to note flaws and inconsistencies in arguments that may discredit the author’s arguments. It is by evaluating the data and arguments that one can truly discover which locality is the most plausible candidate; that is, if this mystic city existed in more than legendary imagination. The first record of Camelot being mentioned was in Chrétien de Troyes’ poem, Lancelot, the Knight of the Cart, which was written in the 1170s, six hundred years after England was ruled by King Arthur according to legend. Camelot is only briefly mentioned and is not described; “upon a certain…[d]ay King Arthur had come from Caerleon, and had held a very magnificent court at Camelot’” (Vv.31-32) (15). Interestingly, while Geoffrey of Monmouth wrote the Historia Regum Britanniae at around the same time, with a description of the mythical historical legend of King Arthur, he never mentioned the word Camelot. However, he claimed that Caerleon, Wales was an important location for the king. This led many to surmise that this Caerleon must subsequently be the mythical Camelot. Such premature assumptions and assertions are unscientific and have little basis on undisputed facts, and thus should be treated with caution. 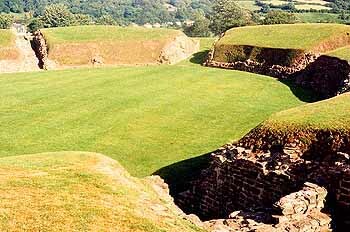 Despite this fact, many were convinced that the magical site was in Wales, and it was only in the 13th century that Camelot superseded Caerleon in importance. Even then, many of the descriptions of the latter location by Monmouth, were simply transferred to Camelot (15). Thomas Malory in the 15th century is credited with depicting the Camelot most familiar to English-speakers, in his book Le Morte d’Arthur (The Death of Arthur). He diverged from the earlier writers with his assertion that Camelot was in Winchester, Hampshire. The last argued potential location emerged from John Leland’s accounts in 1542 in his search for England’s Antiquities, where he argued that the local people around Somerset believed “South Cadbyri” to be the genuine Camelot (27, 29). Sources 19 and 29 entertainingly provide the supposed original Old English version of this discovery, in its apparent original form. Cadbury has prevailed to be the most commonly believed locality for Camelot, and large scale archaeological digs in the 20th century were organized by the Camelot Research Committee to attempt to verify this claim (1). These excavations and their findings will be discussed below. Camelot was not solely the name of this magical capital; rather, it has also been employed to symbolize a time of hope, a time of prosperity and success, as well as a place of ideal qualities (14). It is for this reason that the John F. Kennedy administration in the 1960’s was affectionately referred to as the Camelot period (25). The president’s inspirational speeches and likeable personality (and perhaps also his Irish ancestry) resulted in citizens making parallels to the wise and kind King Arthur of the popular legend. In a haunting way, his assassination in 1963 was even depicted as the “fall of Arthur” (15). 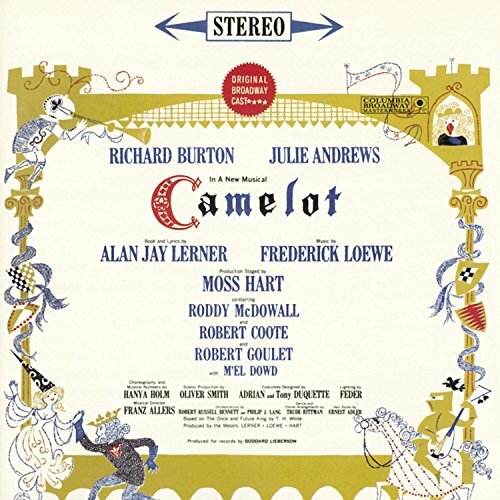 Camelot has also been used in a variety of filmed productions, such as “Monty Python and the Holy Grail” which was later on adapted as Spamalot for public performances (15). Moreover, Camelot has been dreamily viewed as a place where even the impossible is a possibility. This is evident in The Camelot Schools and Californian Camelot camps that respectively provide services designed to instill a sense of pride and accomplishment for troubled youth and children with disabilities (33, 16). In the 1960’s, the famed musical team of Allan Jay Lerner and Frederick Loewe produced the successful musical of Camelot, starring well known (and emerging) stars, such as Julie Andrews, Richard Burton and Rock Hudson (21, 15; see image 1). It was based on The Once and Future King by T.H. White, a literary version of the legend (15); however, it is unfortunate that almost no web sites provided information on why this book was chosen, how close it remained to the original legend, and when it was written. The performances ran for a respectable 837 shows, premiering at The Majestic Theatre (21). Image 1: Original production poster for the Camelot musical by Lerner and Loewe, 1960. 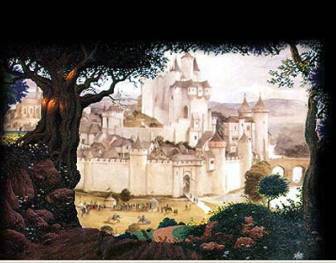 The play was extremely influential in providing the public with an indelible image of what Camelot must have looked like in its time of magical existence (see image 2). One cynical viewer bemoaned how the musical bore little resemblance to the legend, was over-dramatized, and “rip[ped] the middle of the story out” (23). While the credibility of this anonymous critic is not provided, it does make the valuable statement that one must not accept everything shown by the media as absolute truth. In a similar vein, this very attitude must be employed in examining the claims for the true location of Camelot. The arguments and so-called “evidence” must be examined cautiously and critically. With this romantic image in mind of a beautiful and joyous capital, many people naturally would like to discover if there is archaeological evidence to prove the actual existence of Camelot. While there have been many arguments on possible locations for Camelot; some more convincing than others in terms of archaeological proof, the places most commonly accepted to be Camelot in Great Britain are Cadbury Hill, Winchester and Caerleon. Source 22 even made the claim that Cornwall was linked to Arthur, in the amusing but farfetched claim that the legendary king’s profile can be seen at the edge of the cliff face (see image 3)! People should be wary before they place complete trust in claims that use (naturally formed) sides of cliffs as their main sources of proof. While no further discussion is provided, this was probably used to corroborate the belief that Arthur was associated with Tintagel, in Cornwall, if they were unconvinced by the questionable “Arthur Stone” to be discussed. 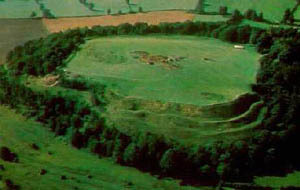 While many believers unofficially were convinced that Camelot was located in Cadbury Hill, archaeologists only became convinced of this being a true possibility with physical evidence, when amateur female archaeologist Mary Harfield retrieved some local potsherds in this location that were dated to the 6th century; the time of King Arthur (9, 28). Harfield (who often goes unnamed and uncredited in many websites, (28, 17, 18, 29)) made this discovery in the 1950’s. Dr Ralegh Radford examined these findings and discovered that they were similar to the ones he had uncovered at the Tintagel Castle that many conclusively associate with King Arthur. He thus became convinced that someone of equal standing and antiquity had lived in this area as well, who was also to import the exotic luxury goods once contained in these pots (7). The interest grew and developed into the creation of the Camelot Research Committee under the direction of archaeologist Leslie Alcock and colleagues Dr Ralegh Radford and Geoffrey Ashe. Sypeck claims that the creation of the committee, “gave legends new credibility in the minds of the British public” (31) since well known archaeologists were engaging in the excavations. However, this does not necessarily mean that the general archaeological community necessarily had approved or believed in the mission of this small group, so this fact in itself must also be accepted cautiously. Radford had excavated at Tintagel in the 1930’s as mentioned, a site that was believed to be associated with King Arthur due to the notorious and questionable “Arthur’s Stone” discovered there (34; see image 4). This slab of rock indeed seemed to clearly have the name “Arthur” inscribed on its face, however, even if this indeed was the correct name carved, this does not provide for a necessary conclusion that it was this one King Arthur to which it was referring. The findings and conclusions made by the “discoverers of Camelot” must be viewed with this same level of caution. Image 4: The fabled “Arthur Stone” found at Tintagel Castle and identified with King Arthur. The Camelot Research Committee uncovered many fascinating findings in their excavations during the 1960s and 70s. Dr. Radford’s experiences of engaging with a similar style of imported pottery from the Mediterranean that dated to 500 AD at Tintagel led him to engage in the excavations with the conviction that the famed king had visited both locations at the similar time period (29). The jars were believed to have carried foreign oil and wine, an importation that could only have been possible under a rich and powerful monarch (28). One must be very careful not to form quick and seemingly simple conclusions about these apparent links, as there could be other possible explanations (27). For instance, it is extremely conceivable that there could have been another similarly wealthy lord who also imported pottery and goods of this type. Such an act was neither uncommon nor unique and thus it is premature to attribute it solely to King Arthur without other substantive proof. While admitting this fact, the committee still hoped that other findings that could undoubtedly be attributed to the legendary king would be unearthed to allow for the desired link to be conclusively made. However, many archaeologists believe the committee simply discovered the remains of a wealthy lord whose identity could not be conclusively made. They are not convinced that the committee did indeed find undebateable proof to be able to truly claim that Cadbury Hill was indeed the resident city of King Arthur, the famed Camelot. In fact, Ford claimed that modern archaeologists have recently re-evaluated and discredited some of Radford’s conclusions of his various Arthurian excavations (17, 18). While archaeologists have been unsatisfied that the committee had irrefutably proven the whereabouts of Camelot, the Camelot Research Committee’s findings do have much archaeological value as its excavators did quality work in the digs. While Cadbury Hill does not have a castle (6) (and yet is persistently called Cadbury Castle in most of the sources) (6, 7, 17, 18, 29), it is unique and without parallel to anywhere else in post-Roman occupied Britain, in its degree of fortification (2, 29 see images 5 to 7). Cadbury Hill boasts a strategic stronghold unmatched anywhere else in the area (3, 6; see images 6 and 7). There is evidence of strong gates from post holes and there are the remains of a refortification of the area by a powerful surrounding mortar-free wall in the late 5th to 6th centuries (7, 27, 26). Sypeck confidently explained the reason for the lack of a castle by stating that it was because the area “predate[d] the age of the brick-and-mortar things we think of as ‘castles” (31). His overly self-assurance is problematic as it is not substantiated with any research backing. The web site 18 provides a valuable reconstruction of how the fortifications might have looked in their original state in the 6th century, on the basis of these archaeological claims (see image 7). 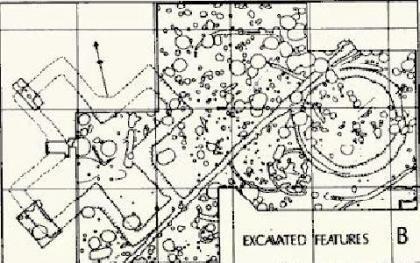 Image 6: The findings at Cadbury Hill, excavation site of the Camelot Research Committee. Image 7: Evidence of the heavily fortified Cadbury Hill, as envisioned by an artist. Sources 29 and 9 depict an impressive looking map that documented the finds of the Camelot Research Committee excavations. While the author probably felt that this image increased credibility for his views, it rather had the opposite effect, as upon closer inspection, it becomes apparent that the image is unclear, and the interpretations and its message vague and thus problematic (see image 8). The image thus defeats the purpose of trying to portray the findings as being more authentic and thus valid. Instead, the map throws problematic suspicion as to why the state of the image was this way. The excavators claimed that the vast fortifications mentioned above had surrounded a castle that resided within its protection. However, it is surprising that none of the sites’ authors attempted to provide any explanation for this lack of a building that clearly would have been important for a king. Suspicion thus arises that it is possible that this deficiency was carefully omitted from their analysis as it would be viewed as ‘unnecessarily’ weakening their argument that this was indeed the location of Camelot. The extreme fortifications and security could only have been coordinated by a powerful individual who had the means to employ the required workforce necessary for its construction (17, 18). The fortified walls’ unyielding protection directly coordinates with Arthur’s long term campaign to keep the invading Saxons from attacking his land (6), thus there is valuable congruence between the archaeological findings and historical belief. Therefore, while it is not yet possible to declare conclusively that King Arthur was the force behind such imports and fortifications, it is clear that Cadbury had been occupied by the right kind of person; a “powerful [and rich] British warrior chieftain”, at approximately the correct time (12, 27, 7,4). This is a powerful if only preliminary assertion, and the excavators admitted that while the individual could have been anyone of these qualities, it was their hope that they would discover findings that would indisputably prove him to be King Arthur. Of all these sources, only source 4 has a complete list of sources that substantiated the author’s arguments. As a result of the above discussions, Cadbury Hill is the contestant that is most often accepted as being Camelot. An author writing at the time of the excavations in Time Magazine wistfully stated that in order to successfully clinch the link, one would have to find an artifact that undisputedly had Arthur’s name inscribed. This very publication is unique in its date being contemporaneous with the excavations themselves, because the CRC members never directly published their findings online. The author of “Quest for Camelot” mentioned that one of the diggers claimed to have found a “carved letter ‘A’” (28). No further details were provided as to this artifact, and as it was not mentioned in any other source, it can be promptly disregarded. One must be extremely skeptical of such claims which often have little validity to them, due to there being no further proof of them and a deficiency of similar minded authors who substantiate the claim. As will be shown, similar findings with claimed links to Camelot and King Arthur have been found, whose validity must be carefully evaluated. Leslie Alcock, one of the prominent members of the original Camelot excavating team, wrote a fascinating collection of books on the findings of the Camelot Research Committee, with intriguing titles such as “Was this Camelot? Excavations at Cadbury Castle, 1966-1970”. He also wrote about “Arthur’s Britain: History and Archaeology, AD 367-634” and the engaging “Cadbury-Camelot: a Fifteen-Year Perspective” (24). Alcock’s colleague, Geoffrey Ashe was also convinced that Camelot was at Cadbury, and this was shown in his successfully convincing the producers of the Camelot movie to place the capital at Cadbury, Somerset on the map shown at the start of the film (2). 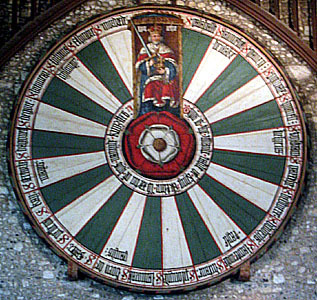 Winchester in Hampshire has also been proposed as being another possible location of Camelot, due to the powerful fact that the city boasts the “original” Round Table from King Arthur’s time (see image 9). Thomas Malory, who was the 15th century author of Le Morte D’Arthur, the novel that popularized the common perception and location of Camelot, was completely convinced by this argument (15, 17, and 18). While some sites’ authors simply accept this proposal, others critically delve into the intricacies behind the matter. For example, Ford confidently argues that “the identity of Winchester as Camelot… is…proofed… by the vast Round Table… hung [there]” (17, 18). However, he then promptly contradicts himself by stating that Malory’s “equations of legendary places with more modern sites, are… highly dubious and easily disproved” (17, 18). Image 9: The “original” Round Table in Winchester, Hampshire. While it does seem to appear that this is the genuine table as it bears the names of the knights around the perimeter in Merlin’s magical gold ink as is stated in the legend, there are some questionable aspects about it. Radio carbon dating has conclusively dated the table as having been built in the 13th century, rather than the 6th century of Arthur’s time. This dating alone dispels the belief that it could have been the original Round Table, as it is undeniably post-Arthurian time. Several sources maintained that King Edward l of this time period was the impetus behind the creation of the table, in a desire to more closely associate himself to the admired King Arthur, and thus gain more credibility for his wielding of power in a political propaganda scheme of conquering (2). It is argued that that the king ordered for the creation of a convincing replica of the Round Table in order to gain credibility for his ruling over all of England, as he felt this would aid in Wales and Scotland more easily surrendering to his rule. He reasoned that the most successful way to achieve status as the rightful ruler would be to create links between himself and the fabled King Arthur. He cleverly rationalized that such an assertion would aid him in authenticating his “claim to the sovereignty of the whole kingdom of Britain” as Arthur had attempted to do as “’the one, true, King of the Britons’” (1). In fact, the king claimed to be finally completing this unfulfilled endeavor (1). The author of source 1 cleverly coined the term “Medieval Spin Doctors” to refer to the individuals who were directly engaged in attempting to forge (or force) a link between the two kings despite a six century gap separating them. This was all part of the propaganda approach of transforming “[f]iction into [f]act for political purposes”. The Arthurian legend was also useful in it conveniently providing King Edward l and later rulers with proof of their ancient “lineage”, which would serve as valuable justification for their reign (1). Thus, the king had a convincing Round Table made according to legendary descriptions and had it displayed in the Great Hall of Winchester Castle (1, 17, 18). It is interesting how this renowned table was mentioned for the first time only a century earlier than its physical date. The Norman poet, Wace was the author of “Roman de Brut” where the table is first mentioned. Some claim that this poem was based on a translation of many of the ideas in Monmouth’s Historia Regum Britanniae, into French poetic verse (1). This author was credited with “embellish[ing]” the Arthurian story and inventing the legend of the Round Table in 1155. The fact that someone had invented the story surrounding the Round Table and the people and events associated with it, provides for the unsettling idea that perhaps the whole Arthurian legend was also of this status; merely a piece of written prose based on imaginative fiction rather than historical fact . This idea must be taken into serious consideration upon examining the ‘archaeological’ findings claimed to be associated with King Arthur. Despite this fact, source 35 persists in trying to prove the Winchester table’s authenticity; however the author’s approach is weak and unconvincing. He argues that there was an inscription on the table that provided conclusive proof as to its valid identity as the original Round Table. This belief is maintained despite the substantial proof that the table could not have conceivably originated from King Arthur’s time, due to the blatant dating evidence. Nevertheless, the author is convinced by the (obviously falsified) inscription that “thys is the rouwnde table of Kyng Arthur… [and] hys namede knygttes”. Whether this message was coined by the website author or by King Edward l himself in the hopes of more firmly convincing his subjects of his legendary heritage, is not clear. However, either way it provides cause to suspect other similar assertions of possibly containing equally fallacious and fabricated content. Thus, conclusions must be undertaken cautiously, and each form of evidence carefully assessed. Sources 30 and 35 made the interesting but far-fetched link between Stonehenge and the Round Table. Not only was it believed that Merlin was involved in the Arthurian legend, but there is also the popular conception that the famed wizard had been instrumental in the formation of the imposing circle of huge stones. From this fact, the author construes a connection between the structure and the legend that he believes to be convincing. This theory must be examined for his reasoning. The circular form and common participating actor is the only real connection that can be gleaned from the bizarre and eccentric website that has startling images with insufficient explanations. Indeed, the various ‘astronomy’ images, boast an unexplained and confusing mix of zodiac signs, Egyptian god names and words such as “Camelot”, “King”, “Queen” and “Excalibur” that are presumably associated with the legend of King Arthur and are randomly interspersed together (see image 10 and 11). Source 31 claimed that the Milky Way could encircle Stonehenge “like a table in the sky”, in order to make the forced connection clear. Additionally, the author claims that the thirty pillars of Stonehenge echo the places for the thirty knights at the Round Table. This last point is problematic as there is no conclusive consensus as to the number of knights at Camelot. As can be seen in image 9, there are only 24 places in the Winchester Round Table, the number of placements presumably being based on the legendary account (1, 17, 18). However, source 25 claims that the number varied according to different historical documents that ranged from a total of 12 knights, to others that argued for 150 places at the table. Since the facts that the author is basing his argument on are not universally accepted nor agreed upon, even further skepticism on his unusual theory. 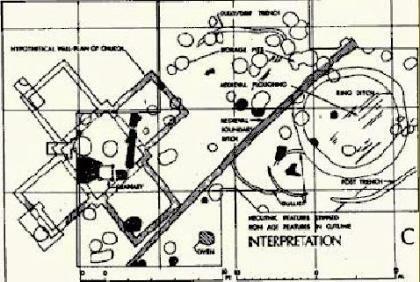 Image 10: The ‘link’ between the circular structure of Stonehenge and Camelot. Image 11: Astronomical references to aspects of the King Arthur and Camelot legend. In addition to having a (or ‘the’ depending on the source) Round Table in his castle, King Edward l took one step further in attempting to secure his credibility to the throne and the connection with King Arthur. In 1283, he had a castle built in Caernarvon, an ancient Welsh town Northeast of Winchester. This was a key location for his medieval castles, and the local people believed it had a direct link to Merlin, who was deeply involved in the Arthurian legend. Thus, the building of the castle was undertaken with the precise motive of further clinching the link between King Edward l and King Arthur. Citizens were convinced that this was the true fabled city as it had sparkling colored walls from different materials, just as was stated in the legendary poems and Welsh mythology (see image 12). This was naturally so as the architect was believed to have used the legends as a building guide for the Caernarvon Castle! (1) Even though the king’s political propaganda and activities have been exposed, it is still an attractive tourist site for people who are excited to view the perceived as “genuine” Round Table. It is interesting but perplexing why Malory, who wrote in the same period as this conspiracy, still maintained his beliefs that this was the true Camelot despite the above discoveries. The secret plot must have been well kept within the community of the “Medieval Spin Doctors” who aimed to convince people that the Winchester Round Table and castle provided substantial proof for locating Camelot at Winchester. 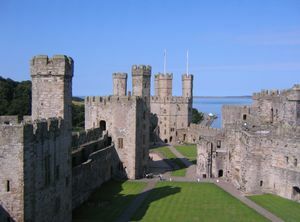 Image 12 Caernarvon Castle in North Wales, created during the reign of King Edward l.
Caerleon was the last proposed location for Camelot due to its mention in the writings of 12th century authors Chrétien de Troyes and Geoffrey Monmouth who claimed it to be so. These were authors who had provided the main substantial documentation about the Arthurian legend (17, 18). However, even this mentioning is not convincing as it was noted that Monmouth had based his Historia Regum Britanniae on an old book was never named and that has never resurfaced (4). The ignorance as to the identity of the book or its content throws suspicion on Monmouth’s own assertions. This is merely worsened by the fact that he was criticized as having loved lying and embellishing the truth, facts which serve to further undermine the validity of his claims (2, 4). Interestingly, Geoffrey Ashe, one of the members of the Camelot Research Committee, stated in an interview that “however wildly [Monmouth] exaggerate[d] and fanaticize[d]… [there was] a factual basis for at least some of his account” (2, 4). Ashe’s proof behind this claim was the “Arthur Stone” that was mentioned, that had been found at Tintagel. This had been one of Dr Ralegh Radford’s pieces of evidence that the imported Mediterranean pottery described, was not merely brought in by an unidentified rich lord. Rather, he felt that the fact that similar pottery had been found both in Cadbury and Tintagel, and the fact that the stone ‘clearly’ stated ‘Arthur’ served to provide conclusive linking proof between the two locations, and thus ‘proving’ the site of Camelot. While it is debateable about whether “Arthur’ is indeed inscribed on the stone, and if it does so, whether it, is referring to this one King Arthur (a point that many sources are unconvinced of (2,17,18)) the point is that Geoffrey of Monmouth had been correct in his having identified Tintagel as being a place associate with Arthur. Thus, Ashe is convinced that Monmouth’s other arguments should be similarly believed due to this fact. Despite authors who are skeptical of such claims, Ashe remains firm in his belief and stated that once conclusive evidence would be found to prove the existence of King Arthur and Camelot, “it would be a triumph for people who believe in taking legends seriously and a setback for historians who try to reduce everything to documentation” (2). Ford admits that historians have been proven wrong before by authors such as Geoffrey of Monmouth, in different contexts. He argues that Monmouth was the sole source to describe the existence of a King Tenvantius of Britain; a ruler that no historian believed had existed. The scoffing historians were proven wrong when modern archaeologists unearthed Iron Age coins bearing the name “Tasciovantus”. While Ford must be commended on his attempting to give more credibility to the British author who had popularized the legend, even this argument is weak. The reason is that the names are not similar, and it is not mentioned when Monmouth claimed the king to have existed, in order to see if the dates corroborated one another. Thus, this argument remains unconvincing and does not serve to prove that if Geoffrey of Monmouth had proven right before, he must be again for Camelot. These cautions provide a critical backdrop to critically evaluating the arguments that claim that Caerleon was the true site of Camelot. Ford described how the place was often called “Arthur’s Table” due to it boasting a “huge grass-covered raised oval hollow around which King Arthur and his knights often sat” (17, 18, 20 see image 13). There is no substantiating of this fact, and Ford’s argument is further weakened when the carelessly chosen quoted section of Geoffrey of Monmouth that supposedly was intended to prove his point, does not mention Caerleon, nor make any reference to a grassy table. He simply relies on an unrevealing photo to express his ideas. Interestingly, if one is to rely on visual meaning alone, image 5 of Cadbury Hill can be argued to be a better candidate for a natural table than Caerleon. Ford’s idea is further weakened when a source noted that the 1926 excavations of the so-called “Round Table”, discovered, not the remains of an English monarch, but rather the remnants of an ancient Roman amphitheatre (18). Thus, his argument lacks substance. Despite these and other faults, Ford provides an interesting appraisal of the various possible locations of Camelot, and even has published a short booklet, entitled “Where to Find Arthur”. This booklet should be read critically and with a skeptical eye, with the identified flaws in mind. Image 13: The “Round Table” of Caerleon, possible location of Camelot. While the location of Camelot has not been unquestionably accepted by all, there are various arguments for a variety of possible sites. Advocates for each one have made reference to historical, archaeological and legendary evidence to make their case more convincing, to varying degrees of success. Thus, while archaeologists can not conclusively state whether Camelot is in Cadbury, Winchester or Caerleon (or none of the above), it is a fascinating exercise to evaluate various claims in order to measure their potential and to one day possibly find this mystical and magical city.